At Singapore American School, the pursuit of passion is encouraged as students learn to identify and leverage a range of abilities that complement one another. We offer a host of extracurricular experiences. The arts are an essential part of the Singapore American School curriculum. Our visual and performing arts programs are among the strongest and most highly regarded in the region; for nearly 60 years, SAS students have explored the worlds of visual and performing arts, developing their skills and confidence and deepening their habits of artistic expression. At Singapore American School, we value competitive sports for the lessons they teach about leadership, teamwork, victory and defeat, and the sheer joy of competition. With a wide variety of sports and playing levels, there’s a home for every athlete on our campus. The variety of after-school clubs in Singapore American School allows students to explore interests in a supportive and engaging atmosphere. 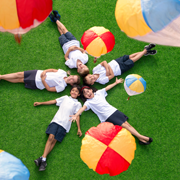 All after-school activities are conducted by faculty, adding another layer for them to connect with students and support them academically, socially, and emotionally. They Eagle Way guides how our students conduct themselves on the field, in the classroom, and in their personal lives. Nothing can prepare you for the transition into the performing arts program at SAS, and that is certainly not a bad thing. Walking into the auditorium on the first day, you are hit with this enormous wave of love, support, and compassion from everyone present. I believe joining performing arts may have been one of the best decisions I've ever made at SAS.